It is important that a refrigerator be in good working condition at all times so that a person can trust it to keep their food fresh at a good temperature. It is important for a refrigerator to be in good shape so that it works in an efficient way. When someone is looking to have their refrigerator repaired, we are here to handle the refrigerator repair work. 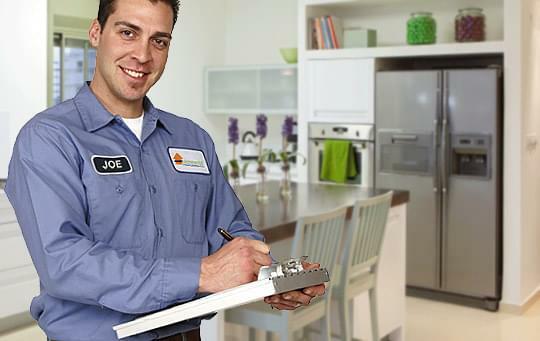 Service Masters Appliance will take care of the refrigerator and get it back to optimum performance. Ice maker not working? Fridge not cooling? A refrigerator will last a long time if the refrigerator repair work that is completed on it is completed by those who know what they are doing. We understand the various types of refrigerators that are out there and we know how to get those working correctly. We know how to look over a refrigerator and figure out what it is that has to be done in order to make it work the way that it is supposed to. Our training and experience helps us to properly handle the repair work that we do. When someone is looking to have someone work on their refrigerator, they have to find someone who will complete the work that needs to be done in a way that is affordable. No one wants to spend a ton of money just to have a simple repair handled. We will take care of the repair work that needs to be completed and we will do that at a cost that is fair. When we care for a refrigerator, we make sure that the job that we do is one that will work out well for the owner of the refrigerator in regard to costs. Anyone who is looking to have refrigerator repair work completed wants to find help in those who care about the work that they do. We care about every job that we take on and we hope to bring about the best results with each refrigerator that we care for and fix. Those who are seeking help with their refrigerator and its repair needs can rely on Service Masters Appliance and the help that we provide.